find in my picks. While you are here try and climb the Tower.. only Lyndzay Mielli has gotten up so far. top for almost free. Naxos Loon even used his chimp av but he still couldn't get up. HA! take that naxos. The visual artist esentially has one main purpose. To make the viewer look at or interact with their creation for as long as possible. When the viewer has moved away then you may have lost them so essentially don't let them leave. A good artist will subtly employ different techniques to keep the eye of the viewer traveling within the piece. For example, generally (and all art "rules" are general) the viewers eye will enter a painting starting in the bottom right hand side. The eye tends to travel counter clockwise in a circular manner moving from focal point to focal point. The artist will then try to lead the eye to areas of importance. This can be done through colour theory, composition or a multitude of other methods. The artist wants to capture the viewer and suspend thier disbelief. Make them feel like they are within the painting. I like to work on large paintings to block out the viewers peripheral vision. Don't let them see a light switch or another painting or even another person in thier peripheral because that only anchors them to the knowledge that they are in fact within a gallery setting looking at a 2D image. Those elements prevent the viewer from becoming fully immersed. And this is where Second Life comes in. I believe the next big art movement will be immersive art, and I think second life is the start to this. We still look at a computer screen and can be distracted by our peripheral, by the need to use a keyboard, by our cat or by the phone ringing. But we have taken the step to be immersed in a 3D environment rather than viewing a 2D image. When space is available I create a story to catch the viewers attention. I create mysteries or environments for participation, and I am constantly trying to think of other ways to further immerse the viewer. We are at the beginnings now but I imagine the art of the future to be when someone comes home from work and plugs into an environment. They might be transported to a canoe on a lake with calling loons or their grandmothers kitchen. But perhaps the real test of an artist will be drawing out the shiver one feels when thier virtual lover caresses their cheek. The feeling of love for an entity which does not exist in the real world, but was able to draw forth such an emotion due to the viewers full immersion into a storied environment. Please come soon Immersiva because winter is coming and I am so tired of Mr. Bush. Song I am listening to at the moment is Courtship Dating by Crystal Castles. So I am fascinated with the idea of being an Artist that exists only on the Internet. No real life connection just an artist made up of pixels and doodads wandering about. I have limited almost everything I can that will influence people... I have no voice, no real life picture, no age nothing that people will connect to the real world when they see me in world. Some kind of entity that creates art and is an extension of her art as well. I don't just make art and then have some shabby avatar that I have put no effort into.. the whole idea is to create a "character", to design myself and be part of the art I create. Artists like Andy Warhol and Salvador Dali had character. They were almost as recognizable as their artwork and it was a contributing factor to their success. Albert Einstein was quite the scientist but Christ what a fantastic character too! crazy hair and somewhat absent minded look. He became a template for the wacky TV scientist. Second life is meant for this and here is a spontaneous short list of some of my favorite second life "characters"
I know I am forgetting some of my favorites and someone really should do a proper list of interesting characters. Hmmm Bettina are you reading this? I decided to open a store in second life the other day. It was mainly due to building ennui. So I searched for a sim that suited my style and was deserted. Then I began writing clues and riddles for people who wanted to find it. Absolutely terrible business practice hiding your store and making people work to find it. Especially in a culture where everyone gets to fly and teleport wherever they want to go, if our avatars reflected this then we would all be big bloated lazy sacks. Anyway, so in my profile i put the first clue. You are probably looking at this and saying "WTF!" which is only right that you do so. You big bloated sack. Well that is the first part and I am not telling anymore as you have offended me now. Go on! get the hell out of my blog you lazy lazy person. Recently I exhibited a build at Burning Man's Second Life presence called Burning Life. I was one of 12 juried artists with some of my favorites such as AM Radio and Sabine Stonebender, but also discovered some new greats such as Blotto Epsilon and Dizzy Banjo. I was given my space a few months before it opened and began thinking up ideas. I thought of current things going on in Canada. We have in Alberta some oil sands. Essentially its very destructive to harvest the oil from the sands.. kills wildlife and destroys habitat not to mention being generally bad for the planet. However, we have a lifestyle we are unwilling to give up and as such this is part of what we need to maintain it. While I was contemplating this I began to wonder what our boundaries are. Not Canada but the human race. What might make us stop and think and decide the outcome was not worth the resources we might get? So I thought perhaps if we found a way to Heaven. A physical Heaven. Here is the poem the build is based on. What resources are there to consume? The build took the form of a store in Heaven that sold angel accessories such as wings and halos. The viewer came in and found a man and his boy choosing wings. The boy points shyly to one he likes while the shopkeeper looks on. Above the store is a captured angel shackled and used as decoration. The shop itself is built to represent what we might build to mimic heaven. Nice blue glass and sleek silver tables. Mood lighting and an almost art deco entrance. Its important for the shopper to enjoy their shopping experience and not think too deeply where these wings and halos actually come from. You see they are one of a kinds, the originals. You can buy Gabriels wings or Metatrons Halo. Both status symbols and personal accessories. As with all my builds there are plenty of little hidden things for those who know my work and know to look very closely. And eventually those same people find a secret door. The secret door leads to the surgery room where they are in the process of removing an angels wings for the store. I won't go into detail about everything in the build but the NPIRL link I added helps. This build existed for one week but wait! it might be coming back.. DB Bailey has said there is an idea afloat for a sim showcasing "Classic" builds and so if you missed it at Burning Life then its possible you can see it there when it opens. I will leave a note if and when it opens. About a year and a half ago I heard about a person who spent their life savings on a condominium in an online world called second life. 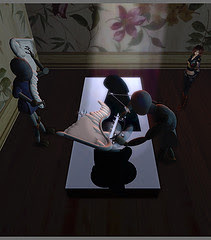 I don't think this story was true, but what it did do was capture my imagination enough for me to come into Second Life and see what it was all about. Originally I created an avatar that looked like me in real life but after talking to some artist friends about what second life stood for I decided to go "other". Other being a giant white moth. I immediately began building things in the back yard of someone who left their land settings to allow anyone to build there. One day they came out and yelled at my big white moth. "Go build in a sandbox!" they shouted and thats when I found out what a sandbox was. A sandbox is a place for building. So I went off to sandbox island and was immediately orbitted several times in a row. This is when i discovered what "griefing" was. I built and built but discovered that nobody really liked me very much as a big white moth. The reason for this? Well I think its because people come into second life and try to project real life values onto our avatars. If your avatar has a lip ring then they use this as a clue to define your real life personality. Its a natural human tendency to search for clues on how to define someone. Watch someones eyes on the subway and you will see them constantly moving over other people figuring them out. So I created Bryn Oh. Bryn Oh has a bit of Emily the Strange in her with a touch of that little kid from the Addams family. She makes Steampunk art and is generally a sandbox hermit. I will talk more about her and my reasons for being in second life in the future and I probably should put up images of my artwork in second life as well.